Weight loss occurs when you burn more calories than you consume. To lose a pound of body fat, you must burn 3,500 calories beyond what your body needs to maintain its current weight. Exercise is a tool that can help you burn more calories to lose weight, but there are other factors you must take into consideration that may be an indication as to why you are not losing weight. What you eat everyday plays a large role in whether you lose weight. You may be consuming more calories than your body needs. Keep a food journal and record every thing consumed throughout the day. You may find that you are eating extra snacks that are inhibiting weight loss. Also, consume high-quality foods in five or six smaller meals throughout the day consisting primarily of fruits, vegetables, lean protein, low-fat dairy, nuts and seeds. If you still aren't losing weight, reduce caloric intake by 100 to 200 calories a day for a week until weight loss begins. Sometimes when you begin a new exercise program, especially if you are weightlifting, you will gain new muscle tissue. Since muscle tissue is denser than fat tissue, you might notice your clothes are fitting better, but the weight on the scale is not moving. This could be an indication that you are losing fat but gaining muscle weight, and the scale is not changing because muscle tissue weighs more than fat tissue. The duration of the exercise plays a large role in weight loss. You may be exercising every day, but not to the intensity level or duration needed for your body to burn fat for energy. Approximately 4 1/2 hours of moderate-intensity exercise that results in an energy expenditure of at least 2,000 calories per week, in combination with reduced energy intake, will help you lose weight, according to the American College of Sports Medicine. This equals about 45 minutes, six days a week of exercise such as brisk walking, jogging, swimming or cycling. Increasing the intensity level of your workouts can help to burn more calories. High-intensity exercise burns more calories that come from fat than low-intensity exercise. In a 30 minute bout of high-intensity exercise, you'll not only burn more overall calories, but a higher amount of calories from fat than a low-intensity workout. 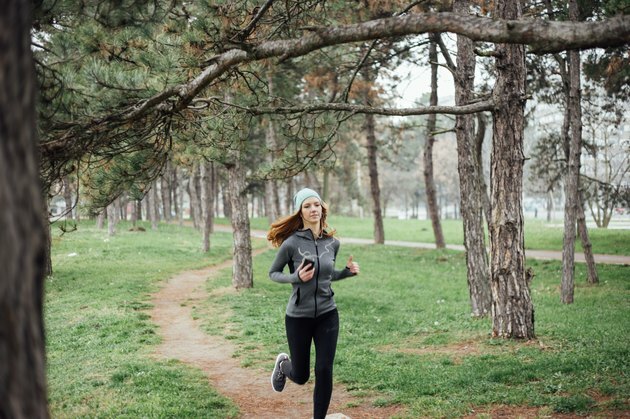 The reason some people stick to low-intensity workouts is that they're simply less stressful, and in some cases, more fun than working all-out at 75 percent of your exercise capacity as you will in a high-intensity workout. If you want to lose weight, mix up your workouts. Alternate, high-intensity with low-intensity. American Council on Exercise: I've Heard that Performing Aerobic Workouts at a Low Intensity is Best for Losing Body Fat - Is That True?